If you've never been to Disneyland during Halloween Time or for the Christmas holiday (which lasts from early November through January), you're missing out. It's already a magical place, but the decorations cast it in a different light and make it even more special. One of my favorite parts during both seasons is the Holiday Haunted Mansion. Disneyland transforms the already wonderful ride by adding a Nightmare Before Christmas overlay. Jack Skellington and his cohorts are found everywhere - outside the house as decorations and as part of the ride. It's fantastic. 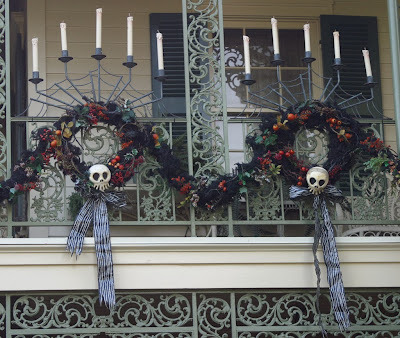 Like many others, I felt like Nightmare Before Christmas was made just for me in that in combines two of my favorite holidays and gave me tons of decorating ideas that could reasonably be up for a few months. It's perfect for me since I'm lazy about putting up holiday themed decor. *Instead of using a grapevine wreath as the base, you could start with a black tinsel wreath (those are available right now and you can probably find them on sale this close to Halloween) and add some grapevine. I started with a plain grapevine wreath (it was around $4.75). I didn't want it to be entirely brown with all the black and fall colors, so I coated the top of the wreath with black acrylic paint. I used a large foam brush so I could squish between the layers of vines. I didn't want complete coverage so I just painted until my quarter-sized dollop of paint was gone. Completely up to your taste. Let the paint dry for a few hours or overnight. 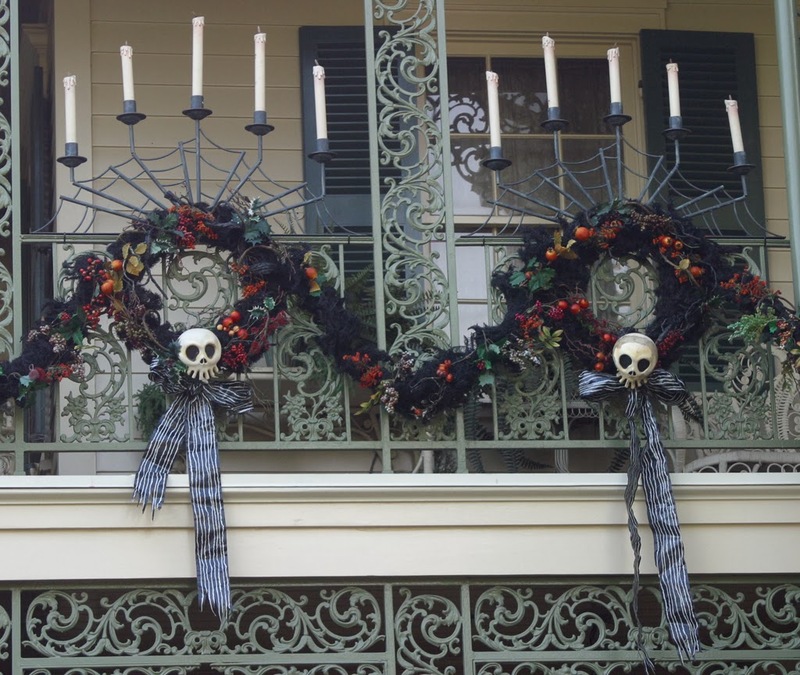 It doesn't exactly match the Holiday Haunted Mansion wreath, but that's okay. It's a combination of what I liked and what the craft store had. The bonus to shopping right now is that most craft stores have fall and Halloween decorations marked at 50% off. Prices will probably be slashed more after Thursday. I had leaves, pumpkins, small pears and Indian corn, and berries in a few different colors. Do make sure to include ivy leaves for the Christmas part (I almost forgot them). Once you have everything in place, use hot glue to reinforce anything not firmly attached by wire. Heck, for good measure hot glue the wires as well. Set the wreath aside to dry. If you happened to find the perfect ribbon, all you need to do in this is step is make a bow. I hot glued four long pieces of ribbon together to make the tails and cut the ends at an angle. The bow part is made from two pieces of ribbon, and I glued then wrapped together with wire I stole from one of the leaves in the floral decorations bunch. If you want to get more precise about the bow, Pinterest is your friend. Since I wasn't able to find black and white vertically striped ribbon, I painted on white stripes. I didn't draw guides before I started painting, but that probably wouldn't be the worst idea. I used the wrong end of the paintbrush to dip in the paint and "draw" the lines. I personally like the uneven and messy look for this project but if you don't, you can draw guides and use the right side of the paintbrush to make them prettier. Regardless of the method, set the ribbon aside to dry while you work on the skull. The skull was the trickiest part. You could make it from foam, but I used polymer clay because that's a medium I sort of know. I printed the above template in a size to fit my wreath and I filled it in layers with an entire 2oz block of polymer clay. I smoothed it a little but it mostly looked rough. I put down thin layers for the eye and nose sockets so I could paint them black later. I made the mistake of baking the skull flat. I should have used foil to bulk it up and make it look more 3D. 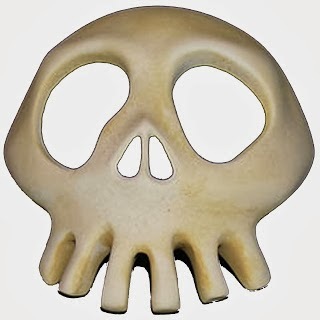 Once you've baked the skull per the polymer clay package instructions and let it cool, you can sand it to make it smoother if you want. When you're happy with it, paint the eye and nose sockets with black acrylic paint. It's also a good idea to paint the edges of the teeth to give them depth. Let the skull dry completely and then go over the skull with thin washes of black so it's not just off white. I like to use the water I've been rinsing my brush in and cover the skull with the black liquid. Dab it off with a paper towel and repeat until you're satisfied. Hot glue the ribbon to the back of the skull (in a few places) and let it dry. Once dry, hot glue the skull to the wreath. I let it dry and added another layer of hot glue for security. Let everything sit and dry overnight before you hang it on your front door. I'm pleased with how it turned out though if I make another one, I'll go with a thicker wreath and a more realistic shaped skull. Demands are catered by the company via https://liteblue.me Portal EASE, PostalOne, etc. Recent version of Netflix application Here & Install it Netflix APK Android applications are already receiving updates. The enrollment procedure for online administration of the discover card Discover Card Login you can complete your task with complete protection.